Little Women 5 (From left) Kelly Mengelkoch as Meg, Caitlin McWethy as Beth, Maggie Lou Rader as Jo, and Courtney Lucien as Amy in Cincinnati Shakespeare Company’s 2015 production of Louisa May Alcott’s “Little Women” adapted for the stage by Emma Reeves, directed by Sara Clark, playing February 20- March 21, 2015. Performances are located at CSC’s Theatre, 719 Race Street in downtown Cincinnati. Tickets are $14-$35 and are available now online at cincyshakes.com or by calling the box office 513.381.2273. By Mikki Schaffner Photography. The women of the Cincinnati Shakespeare Company ensemble are on a roll this year – and LITTLE WOMEN continues that momentum with some wonderful performances. I, along with most men, never read the book and didn’t know the story. Louisa May Alcott’s novel is the story of the four March sisters and their coming-of-age experiences. There’s love, there’s tragedy, and I have to tell you. . . I really liked it. A lot. Maggie Lou Rader, who plays “Jo,” is a bonafide star. She is the most dynamic character in the story and has the most to do and Rader makes the most of the opportunity. She really impressed me in A STREETCAR NAMED DESIRE at the Covedale earlier this season and her streak of terrific performances continued with THE COMEDY OF ERRORS. With this show, her stock just continues to rise. I think Kelly Mengelkoch is the most versatile actress in Cincinnati. Her work in THE OTHER PLACE down the street at Ensemble Theatre last month showed just part of what she’s capable of. Her Mrs. Cratchit in A CHRISTMAS CAROL is perfect. In THE GREAT GATSBY, she played against conventional type again and knocked it out of the park. As “Meg,” she’s done it again, taking what could be a bland character and giving her life. She’s just a natural. Caitlin McWethy’s “Beth” is genuine, sincere, and I really think her future is quite bright. She was brave and selfless with her appearance in THE COMEDY OF ERRORS, but I was fan even before that. Look for big things from her. I also loved the work of Annie Fitzpatrick as “Marmee,” Justin McCombs as “Laurie,” Miranda McGee’s “Sally,” Abby Rowold’s hilarious “Aunt March,” and Nick Rose as “Professor Bhaer.” The costumes in this lush, cinematic show are great. The video projections, lighting, set, and sound design are well done and add to the overall appeal. Sara Clark has directed an accessible show that even people like me who would not necessarily line up for tickets to a show like this can enjoy. Bringing the classics to life is what Cincinnati Shakespeare Company does best and they have another hit on their hands with LITTLE WOMEN. 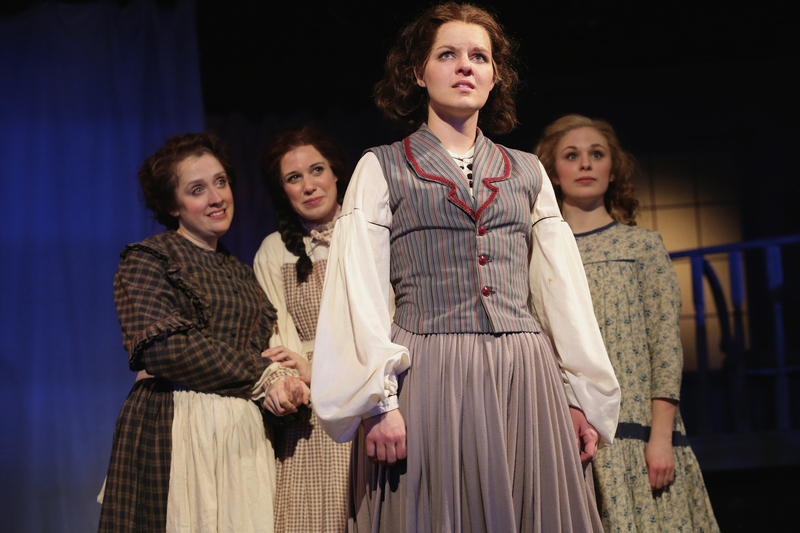 LITTLE WOMEN runs through March 21st. Tickets and more information can be found here.